CELEBRATE YOUR HOLIDAYS IN THE ROCKIES WITH JOHN DENVER & FRIDAY MUSIC!!! MASTERED IMPECCABLY BY JOE REAGOSO –MANUFACTURED AT R.T.I. "Rocky Mountain Christmas" and the stellar artistry of the great John Denver continue to be a must for holiday music listening now for over 40 years. The New Mexico born musical phenomenon with a long enduring legendary musical career broke wide open in the early 60's as a member of The Chad Mitchell Trio, and eventually writing huge songs like "Leaving On A Jet Plane" for Peter Paul and Mary. Upon signing to RCA, John Denver was a hit making machine, recording a plethora of hit recordings in pop, rock, adult, and country genres, he shared his vocal talents for millions of fans with his records, concerts and top rated television shows for many years. He even became a box office draw in several movies over his lifetime. 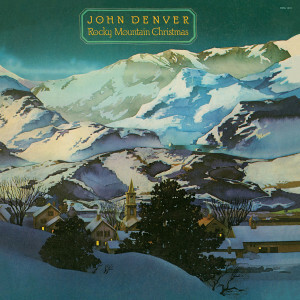 With 1975’s "Rocky Mountain Christmas" Lp, John created one of the most successful holiday top charting hit albums of all time, with this stunning masterpiece. The Lp features his stellar interpretations of both popular and inspirational favorites, as well as his own hit compositions. Definitive hit versions of "Silver Bells" and "The Christmas Song", plus gospel country readings of "Away In The Manger", "Silent Night" and O Holy Night." make this a beautiful revisit to the musical genius of this sorely missed artist. It is with our pleasure to welcome back the 180 Gram Audiophile Translucent Blue Vinyl presentation of "Rocky Mountain Christmas" by the legendary John Denver on Friday Music. This super limited edition audiophile masterpiece is now impeccably mastered by Joe Reagoso and also for a very limited time is pressed by R.T.I. on translucent blue Vinyl for the holidays and features the original Lp artwork, in its original striking gatefold presentation.